I can't believe it's already a week into the new year. I just got my decorations put away today, after a week of procrastinating and bewilderment at how easily exhausted I get recently. I have good energy until about lunchtime, and then I seem about shot for the day. The good news is that I have finished reading an actual novel, and I read about 4 new to me cookbooks. The cookbook reading is nothing new of course, but my healthy title choices were timely since Julia and I decided to go for year #2 of Sugar-Free January. Last year, I felt like I was going through sugar withdrawal. Every single day seemed like a trial, I tried hard to find sweet replacements so I didn't feel the pangs of deprivation. But a weird thing happened after January of 2012 bit the dust: I had recalibrated my sweet tooth. Instead of "needing" sweets, I came to appreciate them in much smaller doses - and I thought carefully before choosing and baking for myself. I have to say that trend lasted throughout the year too. But even though this Christmastime saw only 2 batches of cookies coming from my kitchen, when they were added to the sweets that congregated at the farm for my Christmas break, I definitely felt like I overindulged for the final week of the year. Sugar-Free January is always a good idea I think. This year, I easily went 2 days without even thinking I was missing something sugary at all. Then, a few, well chosen social situations found me making polite exceptions... but even then, I didn't overdo. I ate a small square of coconut cake that barely weighed anything and reminded me of being 8. I had a similarly tiny morsel of peanut butter rice crispy treat with a thick topcoat of chocolate. I ate the last brandied cherry some friends dropped off as a gift. Not all at once, just perfectly curated and well deserved if I have anything to say about it. My goal this year isn't to be as militant as last year, but rather to continue on my path of continual sweets reduction. Over the past year, I have come to realize that it isn't even eating the sugar that appeals so much to me, it's the baking and making with it. I'm happy just tasting something and giving 90% away, and I really just adore any reason to fire up my oven and feel organized in my kitchen. After 20 trips up and down the stairs carting ornaments, lights, and laundry I took a break this morning to make some muffins that almost any diet (except the unfortunate nut allergic) can appreciate: Carrot-Banana Muffins. They come from a new cookbook written by healthy diet and living guru Dr. Weil (compiled with help from a chef and a restauranteur, Michael Stebner and Sam Fox). Most times when reading Dr. Weil, I just really want to hire a private detective to see if he occasionally stops in at a donut shop in a moment of weakness. I don't subscribe to a life of monastic purity, instead I strive for balance and moderation - and donuts when I feel like it. In the cookbook True Food, there is plenty of inspiration for healthy eating featuring ingredients that are fairly straightforward (except the sea buckthorn, which I confess I had to look up). It's easy, seasonal food that is photographed well and infinitely appealing to a generally healthy eater like me. 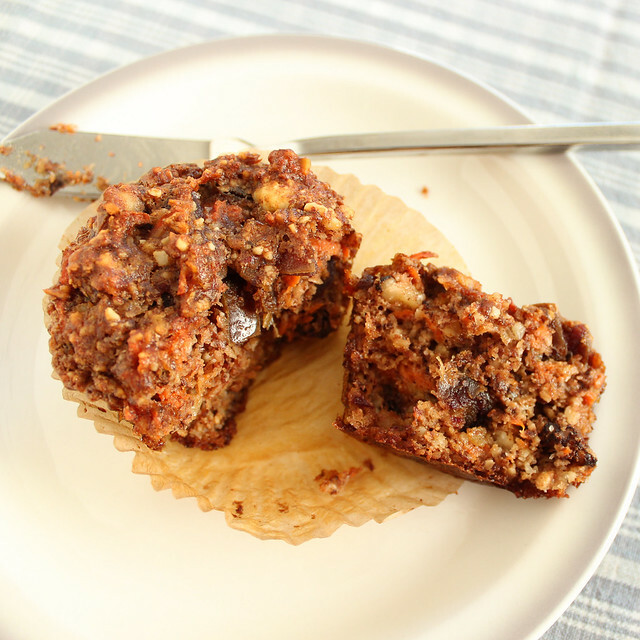 But I didn't get truly excited until I read the recipe for these muffins which not only fit nicely into a sugar-free regimen, they also are gluten and grain free - and full of enough decadent but healthful ingredients to convince you that you've had a slice of cake. And I suspect with a well placed dollop of cream cheese frosting, you would have just that. I ground the last of the almonds I had on hand, which miraculously turned out to be the correct amount. 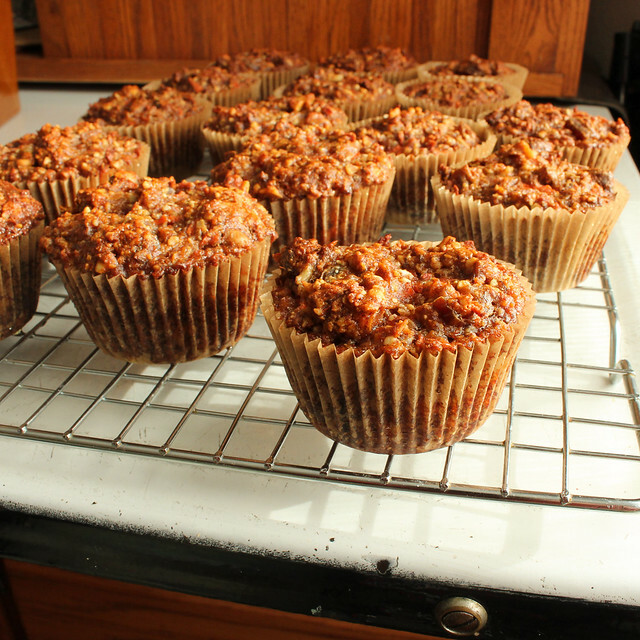 I didn't have the finest almond meal, which was okay with me, and added a great texture to the finished muffins. I also cut back slightly on the cinnamon, walnuts, and dates (on the dates only because I wasn't so lucky with the last of them). They are moist and sweet, like the best carrot cake you've ever had, but better since they aren't hyped up on sugar. You might never suspect there isn't a single granule of refined sugar in these. Preheat oven to 325, and line a muffin tin with papers. In a large bowl, combine almond meal, baking soda, salt, cinnamon, and coconut and whisk well to combine. In a separate large bowl, beat the butter with an electric mixer (or by hand) until creamy and soft. Add eggs, bananas, honey, and cider vinegar and beat until well mixed. Add the wet ingredients to the dry, and stir well to combine. Fold in the dates, carrots, and walnuts. Portion into muffin cups (you can fill them quite full, there isn't a lot of rise), and bake for 35-40 minutes until a tester comes out clean. Cool in the tins for 5 minutes before removing to a wire rack to cool completely. 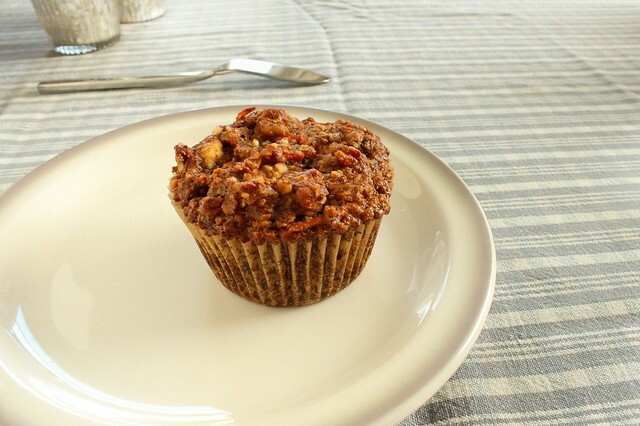 Even better than the flavor and texture of these muffins, is the appreciation that comes when finishing one. Normal muffins have me craving a second as soon as I finish the first - and these were satisfying enough to stand at a single muffin portion. Perfect as the great sugar contemplation of 2013 is fully underway. I haven't quite decided how I will store them. I suspect I'll keep a couple in the refrigerator for a few days since they are so moist I think room temperature could be quickly detrimental. The rest will go into the freezer, for tucking into my bag when I'm not sure how long the errands will take, or for snacks at the movies that I hope to get to sometime soon. I am looking forward to seeing how they age!